Combine studying and volunteering while living in Peru for a semester and earning credits towards your degree with Kaya on our Semester Study and Service Abroad program! What a better place to live and study abroad than Peru, the land of the Incas! You will be located in the heart of Cusco, the ancient capital of the Inca empire, declared cultural heritage of humanity by UNESCO and archaeological capital of South America. You will spend 4 months studying in Cusco on a campus only a few steps away from Coricancha, the main Inca temple; while volunteering one day a week within the community. Enjoy the biodiversity of Peru, and study courses on topics like languages, humanities and social sciences, art and architecture, communication, business, environmental studies, health and nutrition, tourism or even gastronomy! Courses are either taught in English or Spanish. During your study and service abroad, you will be able to apply what you have studied in the classrooms while travelling to different archaeological areas and communities where you be volunteering as well as learning about local traditions and culture. You will have the choice to live on campus in a modern residence with other international students or stay with a homestay family where you will be learning about Peruvian life. If you are a university student craving to go abroad while not wasting time to earn credits and complete your university degree, this Semester Study Abroad and Service in Peru program is for you! During this semester study abroad and service, you will you be able to take up to 5 classes at Universidad San Ignacio de Loyola, immerse yourself into Peruvian culture, and give something back to the local community through your volunteering efforts one day a week. All that while learning a new language! This is a great addition to your resume/C.V. and will make you stand out from the crowd when it’s time to apply for a job! Throughout the semester, you can take up to 5 courses in either English or Spanish in a variety of fields including languages, business, environmental studies, art and architecture, tourism, health and nutrition, humanities and social sciences or gastronomy. Options of classes can be found here. Your classes are designed to be interactive to apply what you have learned in class to the real world. Hands-on experience will be given to you through local expeditions to archaeological sites, exhibitions, government institutions, local educational establishments or museums. Cusco, the ancient capital of the Inca empire, was declared cultural heritage of humanity by UNESCO and archeological capital of South America. It combines a mix of architectures from the Incas royal palaces to the colonial Spanish mansions and beautifully decorated churches, giving it an amazing and magnificent architectural caché for history and construction lovers. It is located close to Macchu Picchu considered one of the 7th wonders of the world. Cusco is situated at an altitude of 3400 meters (=11300 feet) in the heart of the Andes. The region boasts with spectacular landscapes and very diverse plants and animal species. You will have the choice between staying with a local Peruvian family and learning about the local traditions and culture first hand. Or you may decide to stay in a student residence throughout your stay with other students. 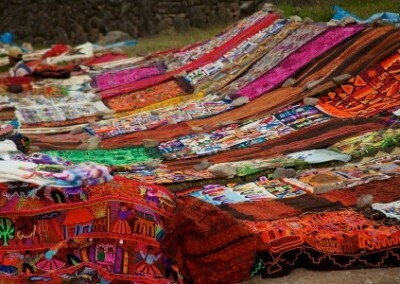 Cusco offers plenty to do in your free time. You may choose to soak up the culture by taking a seat on a bench at the Plaza de Armas. Or you may want to explore the streets of Cusco and admire the mix of architecture. Make sure you stumble across the 12-angle stone on Hatunrumiyoc Street. Go wonder around the San Pedro Market to enjoy some local flavors. Hike up Cristo Blanco for a stunning view. And be sure to take advantage of your proximity to go visit Macchu Picchu.